Regular readers may remember that there was a local parish staff person present at Holy Wisdom Monastery when I went there to deliver testimonies of local parish Catholics on why Catholics shouldn’t support the place. I carefully avoided any identifying info, but reported that I also gave the testimonies to that person. Without any happiness, but with a preparation of prayer, it’s time to tell that story. His name is Ed Emmenegger, and he is a pastoral associate at Blessed Sacrament Parish in Madison. Parish bulletins describe him as director of RCIA; he also visits the home-bound and those in nursing homes. Ed has an extensive history of service in local parishes; before he began working at Blessed Sacrament in 2001, he was a DRE at Saint Dennis Parish, if I recall correctly what one of his former catechists there told me. He served also for six years as Society of Saint Vincent de Paul District Council President, ending in 2009. Based on his LinkedIn page and other sources, Ed has a priest’s education from Loyola University and the University of Saint Mary of the Lake (Mundelein Seminary) from which he graduated in 1974. Ed is now a married layman, with four grown children. Particularly because he is very oriented toward serving the less fortunate, I know confidently that there are many lovely things about Ed, and things he has done that give him much credit, and I regret that because I do not know him personally I do not have have the details to cite that would humanize the good qualities I know that he possesses. Blessed Sacrament Parish is staffed by Dominican Friars, and the current pastor, Fr DePorres Durham, OP, is I believe new in town as of last November. There are many very good things to say of Blessed Sacrament, and some have said that it used to be really off-the-rails liberal in the past and has gotten much better in the last few years. 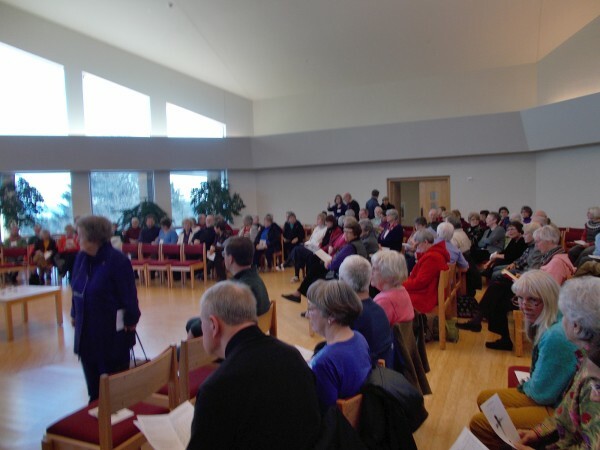 Nevertheless, Blessed Sacrament is one of several local parishes which in recent years hosted a variety of programs presented by the members of the Sinsinawa Dominican Sisters’ HWM-connected Wisdom’s Well Interfaith Spirituality Center, the members of which Bishop Morlino disapproved last year to to be speakers on Catholic premises. Those leading programs at Blessed Sacrament included not only Sr Lynn Lisbeth and Sr Maureen McDonnell, but surprisingly even Beth O’Brien, a Holy Wisdom Monastery Oblate who attends their Sunday Assembly; Beth for instance hosted a Bridges to Contemplative Living course at Blessed Sacrament as recently as fall of 2012. And if you don’t know what Holy Wisdom Monastery is then none of this will make sense, so have a look at my extensive coverage of that. In short, it used to be a Catholic Benedictine monastery, but the Sisters quite publicly left their vows, left the Church and now host a lay-led invalid “eucharist” called “Sunday Assembly”, as well as various activist dissent groups aimed against various unchangeable Catholic beliefs, that simply function to confuse people and estrange them from the Church. One of the most scandalous aspects of the Holy Wisdom tragedy, to my mind, was that a whole array of religious sisters and monks remained supportive of the former Benefictine sisters as they left the Catholic Faith and took many laity with them. Numerous religious continued to frequently give talks at Holy Wisdom, for instance, including the Wisdom’s Well members and certain other Sinsinawa Dominicans. Religiously-indifferent, morally relativistic dissenters inside the Church are among those helping usher people out of the Faith and away from the saving Sacraments, and to feel comfortable with that choice. 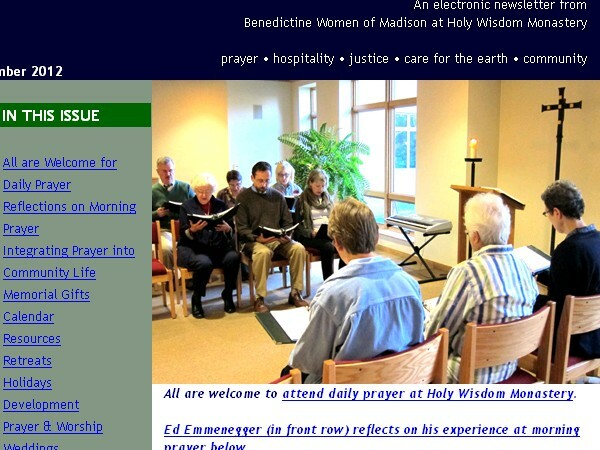 Last November, Ed Emmenegger wrote an article for Holy Wisdom Monastery’s email newsletter, which I took notice of when I was browsing their website in mid December. He describes how he first began coming regularly to Holy Wisdom Monastery to participate in their version of Morning Prayer. On Thanksgiving weekend 2009, while many were still gratefully celebrating the opening of the sparkling and highly acclaimed monastery building, I decided more prayer in my life would be a good thing for Advent. I wanted to see if I could build on positive experiences of morning prayer I’ve had away on retreat in past years. Though I had often prayed in thanksgiving and wonder while walking the trails of Holy Wisdom for years, I wondered if I might re-awaken the love for a time of shared prayer in the morning. He kept going there on a regular basis since that time. The enjoyment he had seems to have been been a contrast from how he felt about praying the Liturgy of the Hours in his past–“an experience I avoided and which left me lifeless in an earlier phase when it was an expected part of my daily schedule.” The language of prayer corresponds with beliefs (“lex orandi, lex credendi”), and at Holy Wisdom the beliefs profoundly differ from Catholic ones and so too in turn does their prayer language differ. All liturgy at Holy Wisdom is neutered, for instance: “In the name of the Creator and of the Redeemer and of the Sanctifier….” In a recent email Abbot Rooney said to me this type of thing “is what happens when one buys into the secular feminist agenda — which is very anti-Catholic, anti-Scriptures, and anti-Tradition.” It is worth noting also, I was recently present at an event at Blessed Sacrament Parish where prayers apparently drawn from the Dominican Sisters’ non-approved Liturgy of the Hours style prayerbook were used, with similarly non-gendered words for God. Two Dominican priests present willingly prayed this as “Evening Prayer,” but some lay people were quick to say this was an anomaly, when I spoke up. May God bless and help faithful lay people! I don’t make it every morning. Sundays I’m at the Catholic parish where I am on staff as pastoral associate. A couple of other days a week I have early morning commitments, making my average about four times a week. And I only come in the morning — it’s close to home then, and a way to focus my day at work. Admittedly it’s the only time available in my current daily schedule, but dawn and dusk have always seemed the most vivid time to engage the Source of all being, eternal Word and gentle Spirit. And that’s truly important: he doesn’t go to their “Sunday Assembly,” but to Mass. I also notice what it doesn’t say: he doesn’t even hint that Catholics who go to Sunday Assembly rather than Mass are gravely failing to practice their Faith, and he doesn’t mention his wife, a “disaffected Catholic” participant in the Holy Wisdom Monastery Sunday Assembly, who has helped organize their children’s ministry, served as a reader at their Sunday service, and organized charitable donations. When I greeted Ed at Holy Wisdom on Ash Wednesday, she was seated by his side wearing her Holy Wisdom nametag. I emailed diocesan Vicar General Monsignor James Bartylla and Blessed Sacrament pastor Fr DePorres Durham. “As someone who prays the Liturgy of the Hours, going to a non Catholic community like Holy Wisdom to pray some version of that is not something that I would do. It seems like their newsletter may be using him to bolster their credibility with Catholics,” I wrote. “Maybe I am totally misunderstanding, if so I very deeply apologize, but his involvement with Holy Wisdom seems like terrible judgement, unless he were more unambiguously there to re-evangelize, to invite people back to Catholic belief and the practice of the Faith.” No reply. I did hear through Bob Bright that Fr DePorres told Ed of my email. It wasn’t a happy moment for me when I recognized Ed on Ash Wednesday in the Holy Wisdom sanctuary. He also realized who I was as I approached him. I simply handed him the testimonies, in a manila envelope. I saw him open and look at it. After the service he approached me. “Ed, I don’t think you should support this place,” I said quietly. He said he realized that (ie, that I think that) but asked “to discuss the reasons why you think I should not participate at Holy Wisdom.” I indicated the reasons were given in the testimonies, but he nevertheless wanted to meet later, to which I agreed while feeling in over my head, and he gave me his Blessed Sacrament business card. I prayed, and I emailed him as he wished. I strongly didn’t want to wind up in a situation where he would try to defend continued support of Holy Wisdom at a meeting, and so my email was firm and clear: “I believe that if you do not support Holy Wisdom Monastery and its errors, you need to make that clear and public and act in accord with that, and if you do support them then you must not be on a parish or Catholic organization staff.” I also told him not to expect any confidentiality in regards to our meeting. I included a link to a blog post of my personal conversion story, “Falling off my Horse”–a story that makes clear both my intimate personal understanding of religious progressives, and how decisively I have turned away from the points of view typical of something like Holy Wisdom Monastery, and leaves no room for thinking I could be persuaded that it’s simply okay. I am concerned that my invitation to talk with you was taken in the wrong way. I don’t have any need to “defend” myself, and I don’t have any reason to be held accountable to defend anything to you. My interest in talking with you was to understand better how God is calling you to take such a forceful role in resolving what you perceive as problems that need to be corrected. He exercises pastoral skills and says some things that are not unkind toward me. In regards to my conversion story, it helps him to understand me, however “I must confess that I don’t understand why you feel a need to put so much about yourself and others in the public forum.” In regards to the entirely anonymous, non-evaluative mentions of his presence in my post Sister Simone Campbell at Formerly-Catholic Holy Wisdom Monastery, “how strange it was to read something on your blog about me, because you really don’t know me, and what you might write about does not really represent the reality of who I am.” Finally, he quoted Tielhard de Chardin via Timothy Dolan’s book Doers of the Word, and wanted us both to pray about the quote which touches on patience and trusting in the slow work of God. Maybe you, dear reader, have as little use for Tielhard as I do, but nevertheless we can all for a moment pray on that. You and I do not change hearts. God’s grace changes hearts. More recently, a newspaper article (which quoted me pointing out HWM is perhaps best known locally for substantive rejection of the Catholic faith, and that priests and sisters should know they are not sending a good message if they attend events there) and a statement on the diocesan website revealed that in March Bishop Morlino contacted religious from various places, and all his diocesan priests and told them not to attend events at Holy Wisdom Monastery. I am consoled that I was not alone in feeling there were problems that needed to be corrected. I never received any responses from Father DePorres in regards to this, either at that time or more recently when, in preparation for this blog article, I inquired to him again by email, nor did Ed respond to a similar recent inquiry, with any further comment. I did not release Ed’s name as part of my February blog coverage of this topic, out of respect for Ed’s long and in many ways extremely positive service in the Church, and hope that this could get clarified and get better discreetly. But I am not aware of anything being better, and remain concerned and dismayed that Ed turned down every opportunity he had to clarify to me or to mutual friend Bob Bright (a great Blessed Sacrament parishioner, Saint Vincent de Paul member, and former Holy Wisdom board member who wrote the first of the “testimonies“), whether he disgrees with the errors of Holy Wisdom. In particular it’s because he’s a pastoral associate and director of RCIA for a parish that I decided to write this. I both believe this whole thing with HWM is a considerably serious situation, and have prayed a good deal for everyone’s good. Father, I do not know Ed personally, as he accurately says in his own email. And it is not to me that he is accountable, as he also rightly says. We are all of course accountable to Jesus, present Body, Blood Soul and Divinity in the Blessed Sacrament. There was an article recently on the website of the National Catholic Register that I found myself clicking back to multiple times. If Catholicism is true, why isn’t everything we do ordered around this Truth? The incongruity between what we claim to believe and the lives we live is revealing. Any honest outsider can surely tell that we can’t possibly believe what we say we believe. Not only is our religion a fraud, but so are we Christians. That’s what Catholics as a whole communicate about Catholicism. If I understand correctly, you feel I’ve committed the sin of detraction, which has to do with revealing another’s sins without just and proportionate cause. Detraction is a very real sin, but when there is in fact just cause to reveal something someone has done, and particularly when there is the potential for correcting a problem, then revealing what someone has done can be the right thing to do and is not in that case the sin of detraction… like the IRS whistleblowers, to give a current secular example. I acted with care not to sin by detraction–and knowing some people would interpret it that way anyway and I might even lose friends, because of some people not seeing the matter as serious as it truly is, or needing correction. […] If I had made his involvement there public immediately it would have been less surprising to people than doing a post specifically about him, but instead I tried to go about it entirely discreetly hoping there would NOT be a reason to make it public, and brought it into public only after there was, very surprisingly to me, absolutely no acknowledgement from Ed that HWM is problematic, no response from the pastor, and after much prayer. Thank you Elizabeth. Praying for all in article. Lord have mercy! Ed Emmenegger may be a faithful, truth-teaching, professional servant of the Church. Nothing in your article suggests otherwise. Not all RCIA directors are faithful or truthful. We need them all to be so. The problem is that our Bishop has indicated that Holy Wisdom monastery is a scandal — they propose to be an “alternative” for dissident Catholics, when they actually NOT Catholic and are only suitable for persons who want no participation in Catholic faith and life. Our Bishop has instructed his priests and professional lay ministers to avoid Holy Wisdom, in order to avoid any confusion and occasion for sin for faithful Catholics. In short, Mr. Emmenegger must choose between his preference of morning prayer and his professional apostolate. I hope that he will give what Vatican II calls “the docility of faith” to this request by our bishop. Elizabeth – After a thorough look at the Holy Wisdom website, I simply cannot find any place where it claims to be Catholic in any way. It describes itself as ecumenical. I’m sure you are aware that ecumenicism is something that the Church and especially our new Holy Father is very interested in. I know Ed personally. We have spoken at length about you and this crusade you’ve launched. Ed goes to HWM to support his wife, among other reasons. Truly though, nobody has ever questioned Ed’s knowledge of the true faith, not as a RCIA director, or in any capacity. Whether he attends a Mosque, a Synagogue, or an ecumenical Christian monastery, I assure you – He is a Catholic. Your calling upon him to declare HWM’s teaching or services as invalid is no different from asking him to declare any other faith, whether that be Protestant or otherwise Abrahamic, invalid. It would be wrong to do so because we are called to teach the truth but to affirm our brothers and sisters of other faiths as allies and friends. Attending their services is an act of Christian outreach and Love. I don’t know why you do what you do Elizabeth. I know as little about you as you know about Ed. I know that you have a tendency to be the the extreme side of every issue. You went from extremist liberal bleeding-heart to extremist Catholic crusader. You feign humility but all that shines through is judgement. It looks to many of us as a cry for attention. What is it that you do exactly? What qualifications do you have to address these issues in such a forceful way? In other words, why should we listen to you? Especially when its clear you can swing from one extreme to the other. I know Ed as a consistent Catholic his whole life long. He is a charitable, understanding, caring Christian soul. Do not expect him to engage you in this. I have confidence that he won’t. In the meantime, I suggest you read the the Letter of James a few times over and see if anything sinks in. Silence is a virtue. Lead by example. Love everyone without judgement. They are accountable to the Lord our God, and if they are Catholic then in this truth they have been well schooled. My great-grandmother once told me very bluntly that if you are concerned, worried, scared for others, etc. Then just pipe down, hunker down, and pray because when the words start flying, gravity has no effect on them. Dear Thomas, thank you very much for your comment. I am going to refer you to the Second Vatican Council for answers to some of what you raise, because the point of view and understanding of the Faith that I am acting on the basis of is that of the Council. It is well known to everyone that Holy Wisdom Monastery gave up the Catholic status of their group. As to whether it is ecumenical, having a simulated or protestant “eucharist” that Catholics and protestants alike participate in and receive “communion”, is not ecumenical, it’s religious indifferentism of the gravest kind. That is what they do there, and when on Ash Wednesday I asked one of the former Benedictine Sisters there where she goes to Mass she said “here.” But Bishop Morlino forbade Mass to be said there ever since 2006, and more recently he’s actually forbidden his priests to attend any events there; thus for sure there’s not Mass there, and a non Catholic, invalid “eucharist” like Holy Wisdom is centered on cannot be said to be “ecumenical”. The Second Vatican Council says “Nothing is so foreign to the spirit of ecumenism as a false conciliatory approach which harms the purity of Catholic doctrine and obscures its genuine and assured meaning” (from the Decree on Ecumenism). Bob Bright, who had been a board member till shortly before they “went non canonical”, told me he felt like what he saw there was that they were trying to erase the differences between Catholicism and Protestantism. Objectively, the outcome of that has been Catholics leaving the Faith and attending HWM’s Sunday Assembly instead of Mass. Besides the former sister I talked to who said she goes to “Mass” there, other HWM participants have also insisted to me that the HWM service is valid as Mass and that they’re practicing the Catholic Faith by going there. They’re not correct, as Bishop Morlino has made abundantly clear. Is fallen-away Catholics and protestants forming a worshiping community together “ecumenism”? Really? Holy Wisdom was founded very publicly, by people who in fact left the practice of the Faith and started a new thing centered on a non Catholic “eucharist”. This was a scandal, and it created confusion since that used to be a Catholic monastery. Unlike the typical protestant community (which a Catholic should not go to regularly to pray their non Catholic prayers, anyway–praying non Catholic prayers based on different beliefs is not “ecumenism”), it’s a new break from the Church. They also host activist dissent groups aimed against unchangeable Catholic beliefs, that see themselves as wanting to “change the Church,” but actually function simply to confuse people and estrange them from the Church, such as “Call to Action,” the pro homosexuality group “Dignity,” and “Women’s Ordination Conference.” I have a lot of information detailing that, follow this link to see my various blog posts. The HWM problem and scandal was enabled and exacerbated by the substantial numbers of religious and priests that kept supporting them and giving talks etc, and in March Bishop Morlino intervened to ask them to stop. I meet very few Catholics who don’t understand readily (if they know what the place is at all) that Catholics shouldn’t support Holy Wisdom Monastery, and to manifest that I asked a bunch of my friends write testimonies about why, and we physically brought them there and gave them out. Why? Out of love for souls, in witness to the Real Presence of Jesus in the Eucharist in a valid Catholic Mass, in hopes we could do something to stop the scandal and particularly to stop the problem of religious, priests and other “official” Catholics (a parish staff person definitely is in that category in my mind) supporting them as if it was perfectly fine to leave the Church. Like reverse RCIA helping people be comfortable and accompanied by these official Catholics, on their trajectory out of the Church. Please, we need the new evangelization: Catholics, come home! God loves you and we love you! Jesus is merciful and gave us the Sacrament of Reconciliation for our peace and healing. I go to confession regularly; I went to confession this afternoon, it is a great grace and help. We have to be converted ourselves, we have to be trying to follow Jesus closely ourselves and helping one another to stay faithful, loving our neighbor truly, walking together. Please, help keep people Catholic, and help Catholics to understand the errors of Holy Wisdom and why not to support it. Please do not try to tell me it’s fine to support others going to this heretical place. We all know you have a good heart and feel strongly about trying to keep others from falling from grace by unknowingly being pulled into non-Catholic services and views. I loved it when you said, “God’s grace changes hearts” that we don’t. You are so right. I am praying that the priests and lay people under Bishop Morlino practice obedience and love to him and to the Holy See and do what they can to remain in grace as practicing Catholics not practicing protestants. My God continue to bless and guide you and all that you do. Thank you for your words Julia, which are kind not simply toward me but toward those in danger of falling away from the Faith. Your reply illustrates to me how impossible it would be to make an another attempt at refuting this silliness, and I am inclined to just let you alone on your soapbox and end up like Simon of the Desert. I assure you I don’t refer here to St. Simeon Stylites, but instead the fictional character of the famed Luis Buñuel classic. This movie, I assure you, will be forty-five minutes well spent in your case. Nevertheless, I will leave you with this. 1.) You argument has its basis in nothing more than semantics. I could simply argue that the word “Mass” is not copyrighted and therefore if you wish to call HWM’s service “Mass” then they have every right to. If they think it is indeed the Holy Sacrifice of the Mass then they are indeed confused, but, I very much doubt that anything you have to say is going to convince them otherwise. In fact, I would venture to guess that nearly ever attendee is well aware that the service they are attending is not approved by the Vatican, The Bishop, or the One, Holy, Catholic, and Apostolic faith. They simply choose, as the Avignon Popes did, to ignore the true faith and claim these words for their own. They are not confused, they are simply standing in protest of what they perceive as injustice and corruption. Now, whether they are right or wrong, is not for me or you to decide. I am a Catholic, you are a Catholic, Ed is a Catholic. We know that however corrupt the Church was, is, or ever will be, it is still the one true faith and it’s servants are mere instruments of God’s design. I believe in the faith and accept it fully, but I do not believe that it requires me to correct those who are not my concern and who have clearly turned away from the faith of their own free will and volition. I’d be better served to be a missionary to pagans. Finally, and I assure you this will be my final word on this sad display of false pity. I still do not see in you any qualifications to interrupt the documents you are interrupting in the forceful way in which you are. I am not aware of any philosophical training or extensive work on exegesis of documents of this sort. I know many people who would interpret the very things you quote to argue precisely the opposite of what you are. This blog that you have, is a nice idea. However, wouldn’t you be better served to promote the faith in a way that is more appropriate to your station in life? I sense in yo a profound longing for humility. Perhaps that’s why you left the world of extreme liberalism. It is stunning to me that this experience has not imbued in you more of a sense of self-awareness, in which you examine this activity as profoundly similar to your former life. Like I said in my original post, prayer, witness, and a profound sense of humility is all that converts. No amount of this kind of crusading will change one mind, one heart, or one out-of-communion Nun. I truly hope that you see this and focus the contemplative life. It will free you of the shackles of your arresting need to judge. I believe it is very evident by your writing and your replies that you are genuine and your concern is real. That is what is most saddening. Someone as loyal to the faith, someone as prayerful, and someone as intellectually curious as you clearly are can spend their time and energies in so much more fruitful a way. Ed will remain where he is. Bob Bright, the man you continually quote, I must say, in my interactions with him, not somebody who would agree with you on many things regarding what a modern Catholic should do and behave like. Be assured, your description of Blessed Sacrament Parish and its staff, laypeople, and clergy does not match in any way what I am familiar with and I thank God for that. I hope the Lord will continually bless you with a true spirit of Christian Love and discerning charity. However you choose to move forward, I wish you great happiness and a loving relationship with our Lord and Redeemer. God Bless you. For some reason the most astonishing thing in your comment is that you want me to have credentials. No, the real credential for rightly interpreting the Catholic faith is to be a saint, so I am reasonably sure I do not have the real and relevant credential. Perhaps through your prayer that the Lord will bless me with a true spirit of Christian love and discerning charity, I may come to have such a credential–may it be so. In the meantime, as a “revert” Catholic grateful for the Sacraments and the grace of being united to Jesus in His Holy Catholic Church, I definitely judge that that is good, but it is not good to be without that. Do you want me to find someone with an advanced degree to quote to you the same things from Vatican II and tell you Lumen Gentium means what it says: “Whosoever, therefore, knowing that the Catholic Church was made necessary by Christ, would refuse to enter or to remain in it, could not be saved”? Now, the documents of Vatican II are addressed to the entire world and one does not have to be a specialist to approach them. But I would like someone who is a saint to come here and tell us about its meaning and to teach us a true spiritual charity and confidence in God. In the meantime I have made bold to point to truth, above all the simple truth about and importance of the distinction between the Mass with the Real Presence of Jesus our only Savior in the Eucharist, and something else that is not the Mass with the Real Presence of Jesus in the Eucharist, as someone who is nobody in particular, who is herself a sinner, who has no credentials, no office, no authority, but has been loved by Christ. I have prayed very much and made bold to advocate that Catholics should remain Catholics and be faithful ones, and fallen-aways should come home, and I would heartily agree that, whoever you are, you could do it better than me, so I hope you will. While I agree with you on occasion about hwm this blog post is in bad taste. To call out Ed, a man whom I don’t know, publically when scripture teaches contrary to this is wrong. Because a man goes somewhere from time to time does not make him a sinner. As a protestant I’ve been to a catholic service am I a sinner for attending. Furthermore the scripture is clear (see matt 18) that 1 if someone has sinned, go to him in private. If he does not respond go to him with other witnesses. If he still does not respond go before the church…not to the blogosphere. I would encourage you to consult only the scriptures. Not some catholic rule book to determine how you respond to hwm. (Ultimately it doesn’t matter what the vatican or the bishop think…but what Christ teaches in his scripture) I think we would come to the same conclusion that heresy is being taught. But instead of attacking respond to them with the true.gospel and plead with them to turn to Christ. Dear KC, welcome and thank you for commenting! If you are interested in discussing the issues of Catholicism and protestantism much further, let us do so in email since that is another matter that would confuse this matter at hand, but I appreciate what seems to be your Christian sincerity. I would argue the central error at HWM is a confusion or indifferentism as regards to the Real Presence of Jesus in the Eucharist, and protestants share a highly similar error (see: Bread of Life discourse in John 6, particularly: “Truly, truly, I say to you, unless you eat the flesh of the Son of Man and drink his blood, you have no life in you.”) Secondly, a rejection of visible unity in the Body of Christ, the Church, and protestants also reject that unity, replacing it with an unscriptural notion of the church an invisible spiritual reality arising essentially from individuals reading the Bible and deciding how to do what it says. Saint Paul says, the Church is the pillar and bulwark of the truth, and that same Catholic Church is also where we have the Bible from, as one can know by reading history. That one Holy Church is the Bride which, like Eve who was taken by God from the side of the sleeping Adam, came from the pierced side of the Lord on the Cross from whence gushed forth blood and water (the Sacraments), and was animated by the Holy Spirit descending on Mary and the Apostles at Pentecost. The Catholic Church today is precisely that constituted by the Lord’s blood and water that came from the side of the Lord at Calvary, its unity with the now risen and ever-living Lord is that concrete, and its continuity from the Apostles is precisely as concrete as the laying on of hands from one to another through the ages in unbroken succession, and this handing on guarantees the integrity of the Faith. Christians breaking apart into tens of thousands of sects with mutually contradictory beliefs, not preserving this continuity, yet all said to be based on interpretation of the Bible, are a witness against the Lord who prayed before His death “that all may be one.” And this radical breakdown of Christian unity has led in time to the dismantling of Christendom due to widespread loss of faith. In regards to Holy Wisdom Monastery, this is an initial break from the Church, rather than an inherited one (like for instance Missouri Synod Lutheranism to name one random, mainline example). Although it does inherit some features and attitudes of protestantism (combined particularly with a marxist-feminist critique of Christianity), it is more like Martin Luther’s initial movement in the sense of being a new rejection of unity and of the integrity of the Sacraments. If you think back to that moment in time, the subsequent thousands upon thousands of splits, in groupings of Christians, and in their increasingly heterogenous beliefs, could have been rejected by good lay people understanding the value of the Sacraments and of Christian unity and the sacred role and mediating authority of the visible Church loved by and intended by Christ and made necessary for our salvation by Him; by simply not supporting the initial movement of Luther but refuting and countering it. And the continual crisis of the Church in every age is always a crisis of saints; Luther was scandalized, as people have always been scandalized, that the Church which in itself is perfect, is made up of many members who are terrible sinners. This sacred role and mediating authority of the Church is present in the Scripture passage you have wanted to refer me to, Matthew 18:15-17 or 18 (this is from the RSV): “If your brother sins against you, go and tell him his fault, between you and him alone. If he listens to you, you have gained your brother. But if he does not listen, take one or two others along with you, that every word may be confirmed by the evidence of two or three witnesses. If he refuses to listen to them, tell it to the Church; and if he refuses to listen even to the Church, let him be to you as a Gentile and a tax collector. Truly, I say to you, whatever you bind on earth will be bound in heaven, and whatever you loose on earth will be loosed in heaven.” Leaving aside the question of culpability (certainly I am not accusing anyone of sinning against me), this guidance was why I decided to keep the matter discreet for some months and to communicate privately about it with Ed, and bring it to the attention of the appropriate Church authorities, as I describe. The power to “bind and loose,” to forgive sins or to retain them, was given by Jesus to St Peter and continues in the ministry of the successors to the apostle–the bishops, united with the successor of St Peter, the Pope–and the priests who serve as an extension of the bishop’s ministry. The bishop has made rather clear statements in regards to Holy Wisdom Monastery, which it seems to me have not been entirely duly respected. When, in Ed’s regard, there seems to have been a breakdown in the relevant Church authorities (ie, particularly Fr DePorres, Ed’s pastor at the parish where he is employed) making any response, I prayed and exercised judgement in taking it further. And I am neither above having my judgement questioned by others, nor necessarily in contradiction to Scripture. We are all called to holiness. We are not called to be fake or indifferent Christians, to ignore the various needs of others or to sit on our hands while people wander from the Church and from grace, and fall into heresy. So when Vatican II says we are “to be more diligent in doing what they can to explain, defend, and properly apply Christian principles to the problems of our era in accordance with the mind of the Church” this is a reiteration of the call to proclaim the Gospel, stated in a way that is for us in our time, in other words it is what charity demands. Would it not be wonderful if there were many more people than there are currently, of much greater virtue and much greater natural gifts than myself, carrying this out? I do so feebly and imperfectly, loving Jesus who has reconciled us to Himself through His atoning self-sacrifice on the Cross, given us this very gift of Himself in the Eucharist and given us unity in His Body the Church–in this is all wisdom and if I lack the fullness of wisdom, it’s not for lack of adoring love of that Wisdom. He has first loved us. We should want people to know, and to live in accord with this truth. This is good news!